It’s been nearly half a year since our first look at a camouflaged prototype of the next-generation Honda Fit, and now our spy photographers have sent us new photos of the funky compact out testing near the Nurburgring. Compared to the previous spy shots, the new Fit has dropped some camouflage, revealing the crossbars in the grille and the square running lights around the headlight lamps. Slits at the corners between the front fascia and splitter are also now visible. From the camouflaged prototypes, it’s clear the new Fit will adopt a drastically different design that looks sleeker than the current model. Gone is the wedge-like nose of the current model, replaced with a more rounded area. At the back, the taillights have a new design that extends into the hatch, rather than vertically into roof. A second Fit prototype was also spotted sporting a roof rack, pronounced wheel arches, and body cladding on the roof. Is Honda cooking up a more rugged, off-road-inspired variant? 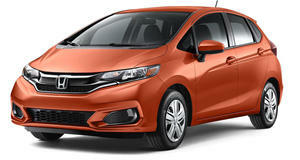 As for powertrains, rumors suggest the new Honda Fit will be offered with a 1.0-liter turbocharged three-cylinder producing 125 horsepower and a new hybrid powertrain. It could adopt the Honda Insight’s version of the i-MMD system that delivers 52 mpg. The Honda EV could also be making a comeback after ending production in 2014 and use a small battery providing a range of 186 miles. It’s reportedly arriving in China before the first half of 2020 but a US launch hasn’t been confirmed. The standard version of the new fourth-generation Fit is expected to debut in late 2019 or early 2020.